David Ivey is a British wildlife sculptor of international renown. The rural life has always been of paramount importance for David; for the ample variety of wildlife, flora and fauna provides the vital inspiration required to create such exquisite sculptures. 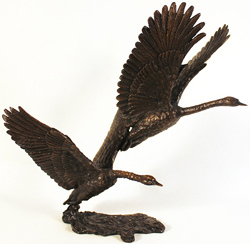 As a self-employed sculptor he has worked for many famous names in the giftware industry over the years. He continues to pursue his ambition to simply ‘capture the beauty and essence of the subject’ with each of his sculptures, and as a result, continues to produce work of illustrious calibre treasured by all. Read the full David Ivey biography.